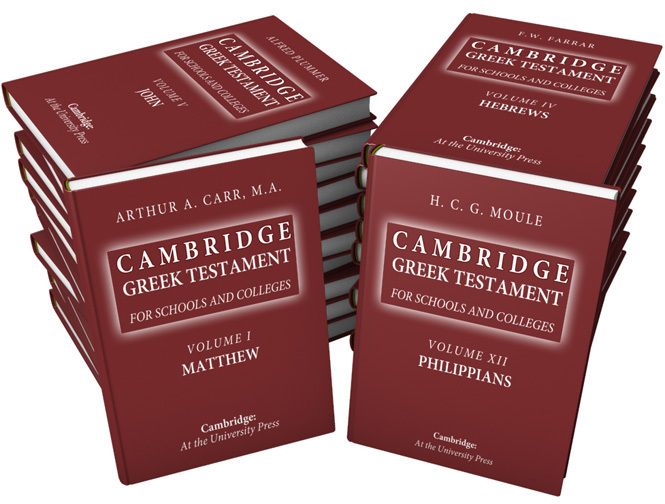 Published around the turn of the century, the Cambridge Greek Testament for Schools and Colleges is filled with great exegesis and written by the best British Bible scholars of that era. This is one of the largest Greek commentaries at BibleSupport.com, with thousands of pages of text which translates into 32+ megabytes of data. Compared with other Greek commentaries on this website, Cambridge is more liberal. Verse by verse, the authors frequently used outlines, historical facts from inside and outside the Bible, word studies, and extensive Greek analysis. Anyone who likes studying the New Testament, Greek exegesis, and theological interpretation will find value in this commentary. Fifteen of the most distinguished Bible scholars of the time wrote this invaluable resource, including Alfred Plummer, Handley C.G. Moule, Arthur Carr, F.W. Farrar, and George Findlay. Each book of the Bible includes a thorough introduction, authorship details, canonicity, reason for its original writing, literary history, and so much more. Very few modern, Greek commentaries trump this set. Of course, we have learned a few things based on more recent manuscript finds, but that has little to no impact on 95% or more of the comments. Dr. Cyril J. Barber, who wrote The Minister's Library, says The Cambridge Greek Testament is still valuable for its exegetical comments. Barber also classifies the scholarship as not as conservative as he would prefer. Most volumes included appendices, additional notes, or excursuses. This material is always included in the Book Comments. When the additional material clearly applied to a specific verse or passage, the material was also included in that verse or passage (in addition to being in the Book Comments). Done right: verse by verse comments with Greek/Hebrew words in blue and properly recognized by e-Sword. The e-Sword commentary can realistically only include one of the Mark commentaries. The main commentary module (Cambridge-Greek.cmtx) includes only Plummer's version, because his presentation is much more technical (linguistically) and he provides a more thorough analysis of the Greek. However, Maclear's version is included as a separate commentary module for Mark (Cambridge-Greek-Mark.cmtx).